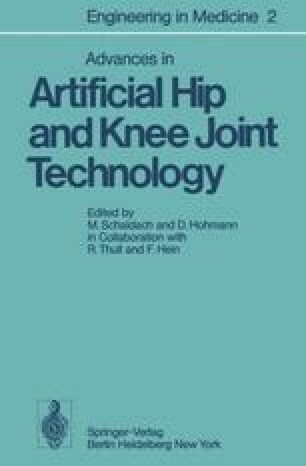 Despite several important earlier attempts, wider use of replacement hip joints was first initiated by the Judet brothers with their acrylic femoral head prosthesis. The good results initially obtained were, however, only temporary. Prosthesis fracture and surface wear with foreign-body tissue reaction around the abraded particles occurred. It soon became evident that polymethylmethacrylate was inadequate for both mechanical and chemical reasons. Furthermore, the metallic portion of the prosthesis was prone to breakage. Broadly, these problems were associated with implant materials (Fig. 1).